If you don't get along with using the built-in trackpad of your laptop - maybe because you feel it is uncomfortable to use, or your wrist keeps accidentally touching it, flinging the cursor halfway across your screen - then getting a small mouse to use with your laptop is a great investment. We've tried mobile mice before, such as the Genius Micro Traveler 900BT, and one of their biggest problems is comfort and build quality. 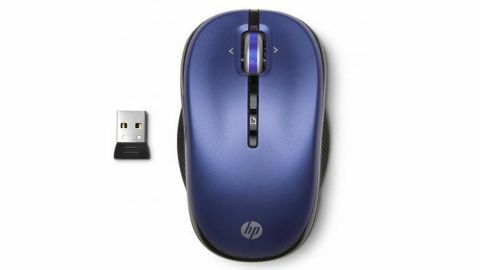 The tiny HP Wireless Optical Mobile Mouse, however, does not suffer from these problems, and is one of the best small mice we've tested. It's small enough to easily carry around with your laptop, and the slim line USB receiver neatly slots into the bottom of the mouse when transporting it, further decreasing its size. A nice touch is that when you insert the USB receiver into the mouse, it automatically turns itself off, saving battery life. Although small, it fits comfortably in the hand, and we happily used it for long periods of time without experiencing the cramps and discomfort that sometimes come with small mice. It looks nice, and although it has a slightly plasticky feel to it, it doesn't feel cheap. It's very responsive as well, gliding smoothly over a number of surfaces with ease. From fabric, to wood, glass and plastic, the HP Wireless Optical Mobile Mouse had no trouble keeping track of our movements. This is an incredibly important aspect for a mobile mouse, since you're not always going to have a desk or a mouse mat readily to hand when you need to use it. Another plus is that it only takes one AA battery (which is included with the mouse - a nice touch), and the battery life is around six months. All in all this is a fantastic mouse for working on a laptop while on the go. It's fast, responsive and easy to carry - it's also great value. The only thing that lets it down is the slightly brittle feel to its plastic shell, and the fact that if you just want a mouse for a desktop PC then you'd be better off getting a larger mouse. For laptops though, it's excellent.